Ventilating your attic is important, both to release summer heat and to prevent winter moisture and ice buildup. A great option for attic ventilation is roof ridge vents, which run as a horizontal strip along the top of the roof and create a continuous air gap. Balanced with soffit vents, roof ridge vents ensure complete airflow through the attic space without electricity or moving parts. However, roof ridge vents can cause problems if improperly installed. 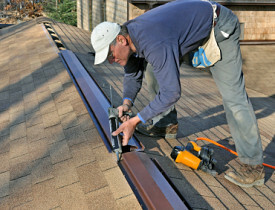 Adding a roof ridge vent can be a DIY project, but not for unskilled weekend warriors. When in doubt, hire a professional roofer. They're energy-efficient, saving you money on electric bills by creating natural airflow without a powered fan. They also reduce your air conditioning needs by removing hot air trapped above the house. They prevent moisture from building up in the attic and causing water damage, such as mold, mildew, and rot. They distribute temperature evenly throughout the roof, to prevent premature deterioration of some sections. They protect both interior and exterior paintwork against peeling. They run along the peak of the house, removing the hottest air from the hottest spot. An attic fan might sit halfway down the roof and not vent all the air above the fan. A fan is also more obtrusive than a thin, barely visible ridge vent. Wind, rain, and snow could blow into the attic through the gap under a ridge vent. To avoid most of this type of problem, install a roof ridge vent with built-in baffles to block outside air. An incomplete ventilation system could cause a lack of airflow through the vent. A ridge vent for outgoing air is only useful in conjunction with soffit vents or other openings for incoming air. Keep soffit vents clear of insulation, dust, and debris for maximum efficiency. Snow can build up on the ridge vent. Depending on your climate and roof pitch, this may be unavoidable. In areas with heavy, lingering snow, consider a vertical extension that releases attic air above the snowdrift. Most home improvement stores sell several roof ridge vent kits. An inexpensive and popular option is the GAF Cobra, which is made of heavy-duty plastic and costs about $65 for a 20-foot roll. Dozens of other options are available, including more expensive and durable metal models. Carefully pry off all the cap shingles. Snap chalk lines along the middle of the roof; then snap parallel lines 1 inch from the center on each side. Cut away the wood and remove the scraps, leaving six inches of wood on each end of the roof. Nail down the ridge vent and affix the end caps. Nail the cap shingles back on. No matter what the material, a roof ridge vent can increase attic airflow and make your house safer and more comfortable. This article was updated November 7, 2017.